The world of business is changing – and with it, the world of marketing. While having a well-adapted marketing strategy has never been more important, the way in which you connect with audiences and encourage them to buy your products and services is transforming. With the introduction of new approaches, the rise of social media and various new channels through which to reach customers and ever more sophisticated technology, you need to make sure that your marketing team has the skills required to thrive in the future. With 76% of marketers of the opinion that marketing has changed more in the past two years than in the previous fifty, it’s time to ask yourself whether you’re adapting with the times and bringing in the talent of the future. Investing time into understanding and streamlining the customer journey is of paramount importance. In a market where potential customers have multiple devices, which are in turn connected to hundreds of different channels and platforms, being successful is all about attracting audiences at as many different touchpoints as possible. Customer-centric marketing is only set to become more prominent, with more than 80% of executives saying the delivery of a superior customer experience is important to their business’s overall success. The rise of social and digital media has given the customer more power than ever, so your marketing team must understand what makes your customers tick and deliver campaigns accordingly. The key to engaging customers is about understanding what’s relevant to them. What issues might they be facing in the market, and what are you selling them to help them solve those issues? What’s new? You need to understand what they want, and the importance of when they want it- and with 72% of adult internet users on Facebook, the Internet is the main method of connecting and making sales. Of course, one of the best ways of engaging with this massive audience is through hiring millennials. Tech-literate, energetic, and typically social media-savvy, tapping into this demographic when hiring will give you the edge with it comes to connecting with your customers: it’s time to think about what you’re doing to attract them in turn. Any emphasis on the customer journey should include an increased dedication to identifying and ultilising the best marketing channels for your organisation. With today’s most effective marketing channels including websites, emails, social media and organic search, and CMOS predicting the top channels to be social media, web and mobile apps by 2020, it’s important that your staff keep their fingers on the pulse and deliver an effective service by working together across multiple disciplines. To this end, avoid placing your teams into silos. Without being able to collaborate and cross-pollinate ideas, your team likely will lose sight of the ultimate aim of your marketing strategy: the customer’s interest. Similarly, without being able to interact, silos often cause a loss of efficiency within the team, as multiple members take on the same task or waste time waiting for approval from above. To create a marketing function that is dynamic, proactive and innovative, work on finding people who will fit well into the group and collaborate with others, whether they’re multi-disciplined or an expert in their specific area. Open communication that encourages marketers to share insights and knowledge on various marketing channels can only help your team prosper into the future. There’s no denying it: the future of marketing is will be underpinned by the huge advances in technology that are currently taking place. 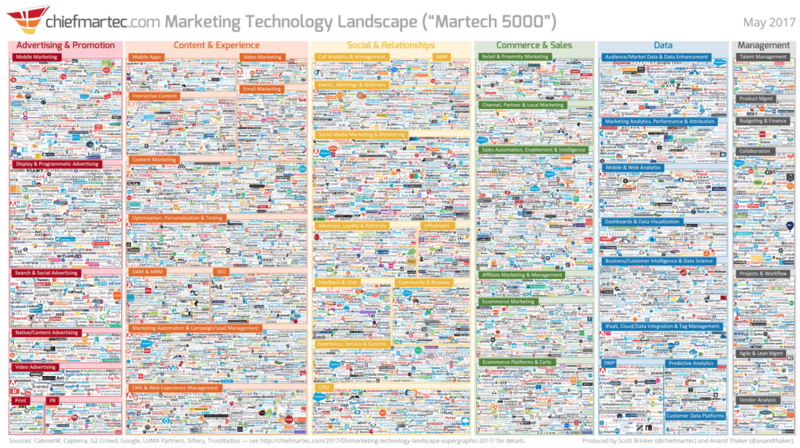 There are now considered to be more than 5000 MarTech tools (those which harness technology to achieve marketing goals and objectives), up from just 240 in the last 5 years. Consequently, the talent that you hire should be tech-savvy enough to make the most of the variety of marketing channels that businesses currently use to connect with their customers, and innovative enough to look to the future. Emerging trends like artificial intelligence (AI) and augmented reality are rapidly gaining momentum, and your marketing team needs to be able to embrace these technologies and understand how they fit into your business function. This outlook needs to be central to your hiring process: though marketers should have a good grasp of specific tools, it’s more important that have the right approach that will allow them to make the most of the fast-changing industry. Do they read widely about new technology? Do they have experience of tech-focussed products? Finding out what interests them and their attitude to making the most of different technological platforms is key to finding people who will be able to lead your business forward in the future. Any marketer that can grasp the changes happening in tech, and more importantly keep up with the pace of these changes, will be a powerful asset to any business. A technology-heavy approach will bring with it a greater focus on the ROI of many of your marketing channels. Though sales and marketing are already closely linked, with 81% of marketers saying that sales is their most important goal for 2017, this focus on the value that different channels, and team members, bring to the team will require both departments to work more closely together. This will allow sales to capitalise on the leads generated by online marketing. Industry leaders the world over are predicting a ceasefire in the feud between sales and marketing, with more data-driven business decisions helping to bring the business functions together. To this end, any new recruits that you bring on board should be able to assess the value that their actions will bring to the business from a sales perspective, working closely with the sales team to create a cohesive sales and marketing function that thrives into the future. When building your marketing team, it’s vital to hire people who will help you to make the most of the rapid changes that are taking place within the industry. From recruiting tech-savvy millennials to searching for people who will bring their unique talents to your team, being a marketing leader is all about looking to the future, and bringing on the right resources to continue to grow. For more on how you can make your marketing team the best it can be, contact us here.